Here’s a look at what happened during Week 11 of the high school football season. 1. Sometimes its better to finish strong than to start that way. Just take a look at the Sunset Region playoffs where Palo Verde is in and Durango is out. Palo Verde started the season 0-6, but won its last three games and managed to grab the Northwest League’s final playoff berth with a 48-20 win over Centennial on Friday. Durango, meanwhile, was 6-0 to start the year before losing its last three games. The Trailblazers lost 34-31 in overtime to Spring Valley on Friday, and finished in a three-way tie with the Grizzlies and Bonanza for third place in the Southwest League. The Bengals got the third seed on a tiebreaker, with Spring Valley getting the league’s final playoff spot. The celebrations are likely to be short-lived, however. Palo Verde gets a matchup with top-ranked Bishop Gorman in the first round of the Sunset Region playoffs, and Spring Valley will face third-ranked Arbor View. 2. Somehow a former NFL quarterback isn’t a big fan of the forward pass. 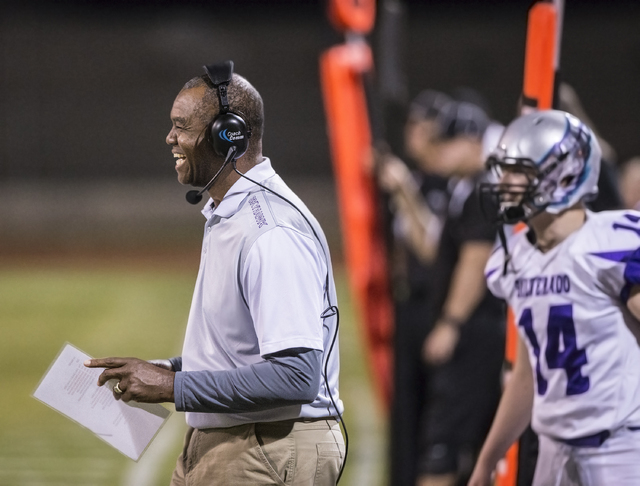 “We don’t like to throw the ball,” said Silverado coach Randall Cunningham. That may be true, but opening up the passing game a bit worked well for the Skyhawks on Friday. Christian Baltodano, who had passed for just 407 yards and eight touchdowns in the regular season, completed 11 of 14 passes for 187 yards and three TDs in a 40-13 win over Las Vegas in the Sunrise Region quarterfinals. 3. Another team that’s not much of a fan of the forward pass is Legacy, where Samuel Turner continues to be a force on the ground. The Longhorns have thrown just 92 passes in nine games, so it’s not a secret that Turner’s going to get the ball most of the time. But no one has been able to stop the senior running back yet. Turner rushed for 195 yards on Friday, giving him 100 or more yards in all nine regular-season games. He leads the are in rushing by a large margin with 1,774 yards on 196 carries. He has 230 more yards than Moapa Valley’s Jacob Leavitt (who has played 11 games), and leads the nearest Class 4A rusher by 283 yards. Foothill 39, Canyon Springs 17 — The Pioneers rolled into the game having gone undefeated in the Northeast League and were ranked No. 4 in the latest coaches poll. But they couldn’t hold a lead against Foothill, which scored 29 unanswered points in the fourth quarter to get the win. Isaac Oliva had a pair of fourth-quarter TD runs, and the team took the lead with a safety that made it 19-17 with 9:19 to play. The Falcons needed a win in their final regular-season game just to get into the Sunrise Region playoffs. Now they’ve set up another matchup with Basic next week, with the winner advancing to the Sunrise final. Foothill started its current three-game winning streak with a 37-35 win over Basic on Oct. 21. — Silverado quarterback Christian Baltodano, who completed 11 of 14 passes for 187 yards and three TDs in a 40-13 win over Las Vegas. — Desert Pines coach Tico Rodriguez after his team’s 28-7 win over Moapa Valley in the Class 3A state quarterfinals. The Jaguars had been eliminated from the playoffs by Moapa Valley each of the past two seasons. — Legacy running back Samuel Turner after rushing for 195 yards and four TDs in a 49-14 win over Palo Verde to secure a spot in the Sunset Region playoffs. — Palo Verde coach Joe Aznarez after his team defeated Centennial 48-20 to secure the Northwest League’s final playoff berth. The Panthers won three straight to get the spot after an 0-6 start. — Bishop Gorman coach Kenny Sanchez after his team beat previously undefeated Sierra Vista 56-7 to claim the Southwest League title. — Foothill coach Marty Redmond after the Falcons scored 29 fourth-quarter points to upset fourth-ranked Canyon Springs 39-17 in the Sunrise Region quarterfinals. A look at how the top 10 teams in the Southern Nevada Football Coaches Poll fared in Week 11. 1. Bishop Gorman (11-0) beat Sierra Vista, 56-7. Next: vs. Palo Verde, Thursday. 2. Liberty (9-1) beat Valley, 54-0. Next: vs. No. 5 Silverado, Thursday. 3. Arbor View (8-1) beat Cimarron-Memorial, 52-0. Next: vs. Spring Valley, Thursday. 4. Canyon Springs (8-2) lost to Foothill, 39-17. Next: Season complete. 5. Desert Pines (10-1) beat Moapa Valley, 28-7. Next: vs. Truckee or South Tahoe, Saturday, Nov. 12. 5. Silverado (8-2) beat No. 10 Las Vegas, 40-13. Next: at No. 3 Liberty, Thursday. 7. Basic (7-3) beat Eldorado, 54-14. Next: vs. Foothill, Thursday. 8. Legacy (7-2) beat Shadow Ridge, 49-14. Next: at Sierra Vista, Thursday. 9. Faith Lutheran (5-4) was idle. Next: vs. Bonanza, Thursday. 10. Las Vegas (7-3) lost to No. 5 Silverado, 40-13. Next: Season complete. For complete coverage of all of the games from Week 11, visit nevadapreps.com.